To Cite: Salehi H, Arab S. Effect of Loop Geometry on Horizontal Forces of Vertical Loops: A Finite Element Analysis, Iran J Ortho. 2015 ; 10(2):e4988. doi: 10.17795/ijo-4988. Background: Alignment of the teeth as the first stage of comprehensive orthodontic treatment has widely been addressed. Several methods such as using super elastic arch wires, multi-strand wires and incorporation of various loops into the round stainless steel wires have been suggested in this stage. Objectives: The aim of this study was to investigate and compare the horizontal forces produced by six various loop designs in different amounts of activation using the finite element method. Materials and Methods: The Finite Element Model (FEM) was used to design and compare the horizontal forces of round 0.014 inches stainless steel vertical open loop, vertical closed loop, vertical helical open loop, vertical helical closed loop, plain vertical loop and the squash loop. The forces were measured at 0.1, 0.4, 0.8 and 1mm activations. Results: For all activations, vertical open loop had the highest horizontal force; while vertical helical closed loop showed the lowest force. Conclusions: The design of vertical loops influences the horizontal force in all activations, immensely. Alignment of the teeth as the first stage of comprehensive orthodontic treatment has widely been addressed. Several methods such as using super elastic arch wires, multi-strand wires and incorporation of various loops into the round stainless steel wires have been suggested in this stage. Despite all undeniable advantages of super elastic arch wires, travelling of these wires especially those with smaller diameters in patients whose jaw function is often unilaterally would be annoying (1). Although straight wire system has far facilitated orthodontic treatment by decreasing the need for wire bending, the sliding and friction which is inevitable in pre-adjusted bracket systems could somewhat be troublesome by adversely affecting the occlusal plan (2). Therefore, applying loops into the arch wires especially in cases of asymmetric crowding is still useful. In addition, in order to resolve some less severe but still extraction case crowdings, activation of drag loops can mildly distalize canines along with relieving the anterior crowding without friction, at a time (3). Furthermore, loops are also beneficial in the finishing stage. In contrast to v-bends used in the final detailing, loops take the advantage of the frictionless and more predictable mechanic (4-6). 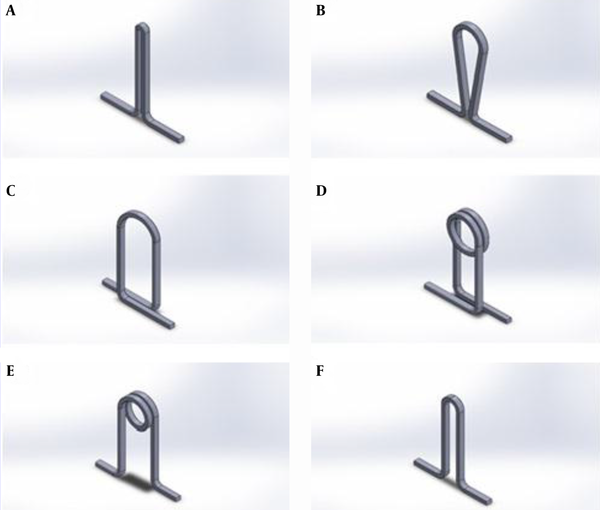 Regarding the benefits of applying loops in round stainless steel wires, the aim of this study was to simulate and compare the horizontal forces of six different types of commonly used vertical loops. Six 3D computer models of vertical loops were designed in SolidWorks 2006 (SolidWorks, Concord, Massachusetts, USA). Loops were designed in a way that they are encircled in an 8×8 mm2 rectangle. The wire cross section was 0.014 Inch (diameter = 0.35 mm). The 3D models were designed symmetric in form. The models were transferred to the ANSYS Workbench Version 12.1 (Ansys Inc., Southpointe, Canonsburg, PA, USA). Boundary conditions restricted displacements of the nodes at one extreme of the loops to prevent rigid body motion. Stainless Steel was the material of the loop (the Young’s modulus = 177000; Posson’s ratio = 0.3) were then applied and the models were meshed between 10026 and 22729 nodes and 5377 and 12345 elements (Figure 1). A, Plain vertical loop; B, squash loop; C, vertical closed loop; D, vertical helical closed loop; E, vertical helical, open loop; F, vertical open loop. The loops were then stretched 0.1, 0.4, 0.8, 1.0 mm in the horizontal axis. The force produced in the direction of the loop was then evaluated. The results of the present study revealed that in 0.1 mm, 0.4 mm, 0.8 mm and 1 mm activations, vertical open loop gave the highest amount of force (between 0.3 to 3 N). The second highest force was shown by the plain vertical loop (between 0.29 to 2.95 N), followed by squash loop (between 0.27 to 2.77 N), vertical helical open loop (between 0.19 to 1.99 N) and closed vertical loop (0.12 to 1.24 N). 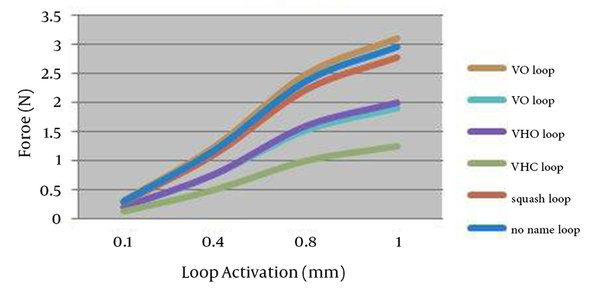 Vertical helical closed Loop had the lowest amount of force in all activations. Forces of each loop design in the four different activations are shown in Table 1 and Figure 2.
aData are presented as Newton (N). This study was performed using the finite element method. Although even this method has some limitations regarding the timing of movement and plastic deformations of loops, it is an advantageous precise method for simulation and investigation of orthodontic structures and mechanics (7-10). Results of the present study showed that vertical helical closed loop has the lightest horizontal force. Since light orthodontic forces take the advantage of shortening the time of tooth movement, preserving the anchorage and decreasing the possibility of injuring teeth and damaging periodontal structures, orthodontic active components which exert lighter forces are preferred (11-14). The most important factors affecting the springiness of closing loops are the diameter of the wire, the material composition of the wire, the inter-bracket distance, and the amount of wire added into the loop (1).Considering the fact that the longer loops are springier while too tall loops are capable of soft tissue impingement, we used 8mm long loops model in the present study. One simple effective way of enhancing springiness via increasing the amount of wire is incorporating helices into the wire structure. Regarding the results of the present study, incorporation of a single helix into a vertical loop reduced the horizontal force down to two thirds in all activations. Results of the present study are close and comparable to Booth’s study who revealed the same sequence of horizontal force from the same vertical loops (15). Under equal circumstances, the loops which are activated by closing rather than opening are more effective. Furthermore, the Bauschinger effect points out that if wires are activated in the direction identical to their original bending direction, they will have higher maximal elastic load (16). Regarding the results of the present study, loops activated by closing also take the advantage of exerting lighter forces which makes them greatly appropriate for clinical procedures. Addition of helices into the wire structure in combination with designing the loop as it activates by closing is capable of creating loops which exert very light orthodontic forces.